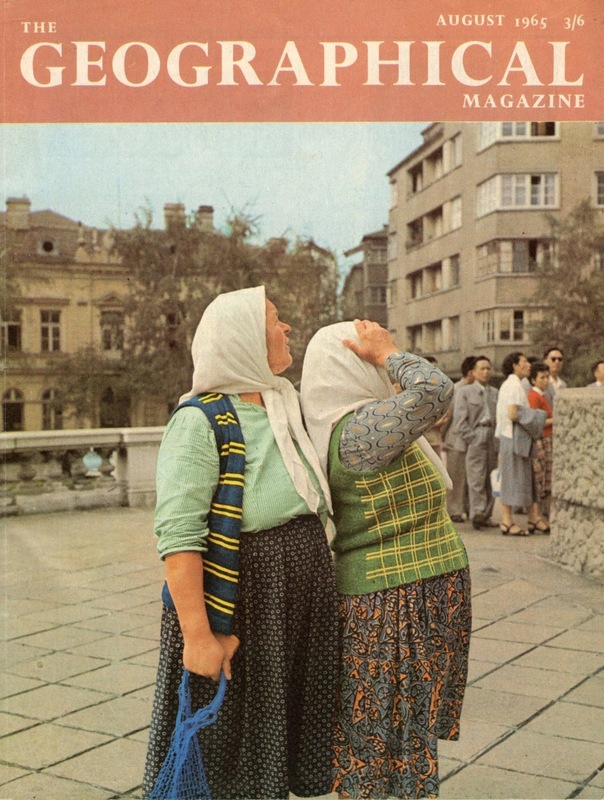 Блог Стара София: България в The Geographical Magazine, 1965 г.
България в The Geographical Magazine, 1965 г.
През 1965 година британското списание The Geographical Magazine представя на корицата си специален материал за нашата страна, илюстриран с кадър от София. Публикуваме цялата статия в оригинал. The Bulgars have inhabited the eastern Balkans for 1200 years. Their land is fertile, with substantial mineral and water resources. Yet the people have been very poor for centuries, unable to use these resources for lack of peace, security and favourable economic conditions. For Bulgaria, centred on the Maritsa basin, forms the north-western approach road to the strategic ‘land-bridge’ between Europe and Asia Minor. Byzantine, Turk, German and Russian alike have tried to use this route to facilitate their political and economic expansion. The resulting wars impoverished the Bulgars of their kin, culture and wealth. The Turks imposed serfdom, severe taxation and discrimination on them as a subject people for 500 years until 1878. Only a century ago, Cyprien Robert described the Bulgarians as ‘an enslaved and wretched nation vegetating in a remote part of Europe’. Young people fled to the mountains where they led a rough life, rearing sheep and goats or forming groups of bandits. They inspired many a song and legend among their serf brethren. Others became monks and built fortified monasteries, like that near Rila, in remote valleys. These became centres of learning, reviving Bulgaria’s mediaeval culture and stimulating the 19th-century liberation movement. Conditions improved a little after 1878, but most of the people still endured a wretched existence. Eighty per cent of the population depended for their livelihood on a bankrupt agriculture. Farms were small and comprised scattered strips of land; as the population increased so farms became further subdivided. Using primitive techniques, which, as a result of Turkish rule, had remained unchanged since the later Middle Ages, the peasant barely subsisted, growing grains and a few vegetables, keeping a cow or goat or some sheep. The use of money spread, and with the economic crisis of 1930, caused indebtedness. Many had to sell their land to pay debts to money-lenders or larger landowners. Life was hard and insecure. Men walked miles daily to, from, and around their scattered fields if they did not possess a horse and cart or donkey. In spring, summer, and autumn, they usually worked from dawn till dusk. Yet their food output was low and often they had no money. The women tended the poultry and a small vegetable garden and they ‘were never without their distaff and spindle’. Libraries appeared before 1914 to widen the peasants’ horizon, but amusements were few, apart from music, dancing, and drinking at weekends, festivals and weddings. A large number of people spent their lives in only seasonal employment, earning their wages for the whole year during seed time and harvest. The towns offered little more than cobbling, pottery, carpet-making, and petty trade, for industry and supporting services, though developing slowly, were rare as yet. 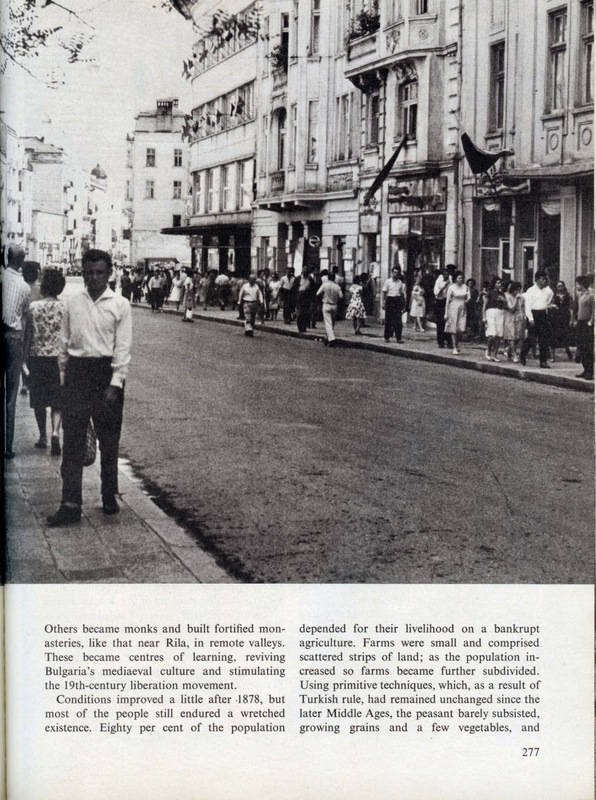 Events since 1944 have brought many changes into Bulgarian life. 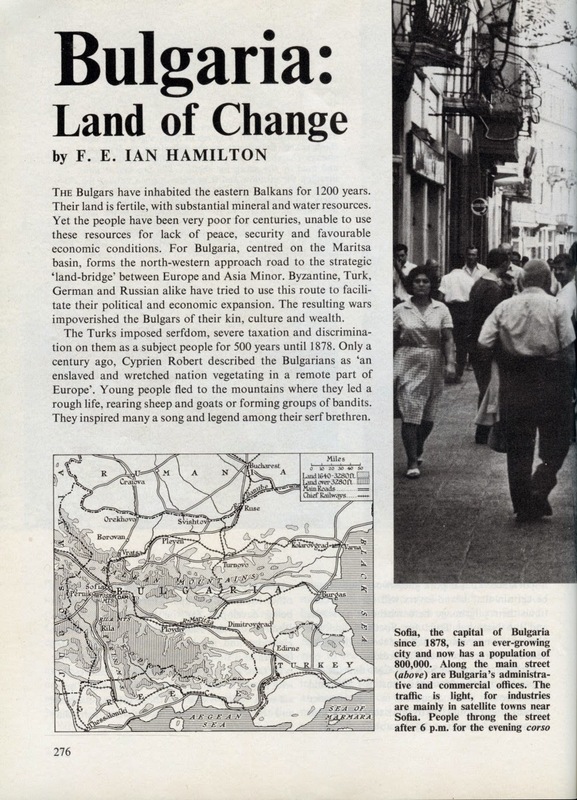 With its authority assured by the Soviet Union, a government has been ruling Bulgaria since 1947 which is bent on transforming a poverty-stricken land into a more prosperous, developing country. Financial resources have been allocated as part of an overall national plan for the construction of industry, the improvement of agriculture and transport, and the expansion of social services. Progress along these lines has profoundly affected the lives of people everywhere in Bulgaria. Between 1944 and 1964 the number of people working in mines and factories rose from 80,000 to over 800,000, while the total population increased from 7,000,000 to 7,800,000 persons. Most undertakings are small and are scattered about the country, though two-fifths of industrial employment lies within fifty miles of Sofia, the capital. 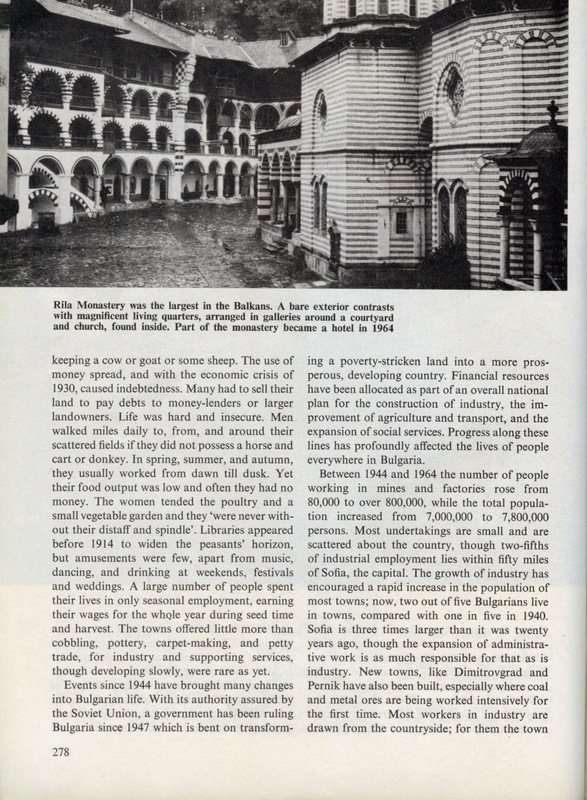 The growth of industry has encouraged a rapid increase in the population of most towns; now, two out of five Bulgarians live in towns, compared with one in five in 1940. 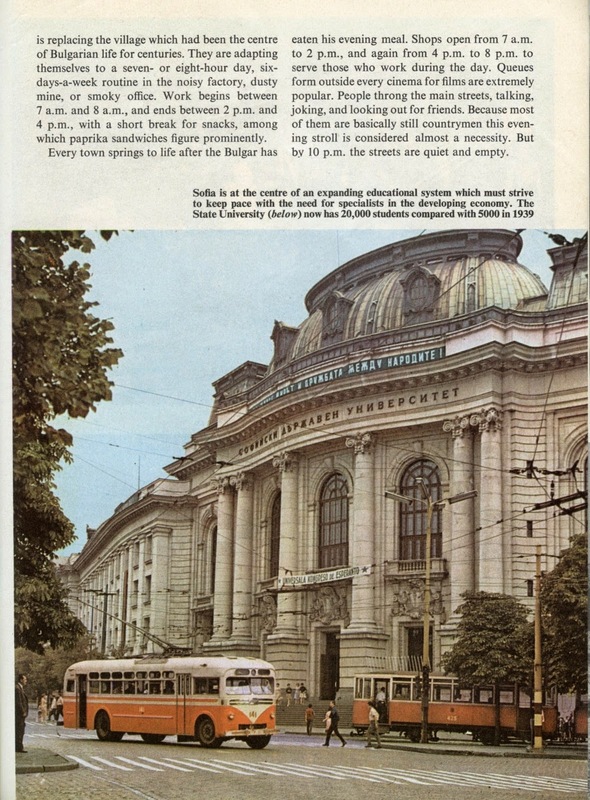 Sofia is three times larger than it was twenty years ago, though the expansion of administrative work is as much responsible for that as is industry. New towns, like Dimitrovgrad and Pernik have also been built, especially where coal and metal ores are being worked intensively for the first time. 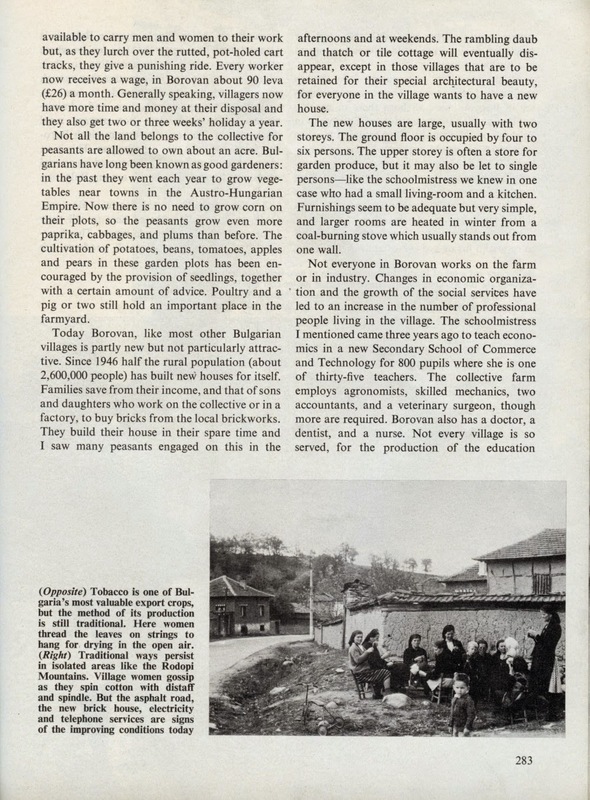 Most workers in industry are drawn from the countryside; for them the town is replacing the village which had been the centre of Bulgarian life for centuries. They are adapting themselves to a seven- or eight-hour day, six-days-a-week routine in the noisy factory, dusty mine, or smoky office. Work begins between 7 a.m. and 8 a.m., and ends between 2 p.m. and 4 p.m., with a short break for snacks, among which paprika sandwiches figure prominently. Every town springs to life after the Bulgar has eaten his evening meal. Shops open from 7 a.m. to 2 p.m., and again from 4 p.m. to 8 p.m. to serve those who work during the day. Queues form outside every cinema for films are extremely popular. People throng the main streets, talking, joking, and looking out for friends. Because most of them are basically still countrymen this evening stroll is considered almost a necessity. But by 10 p.m. the streets are quiet and empty. Transport facilities have been improved in recent years by developing regular bus services over a network of new asphalt roads. Townsfolk now make weekend excursions to beauty spots once accessible only on foot or by donkey, or not at all. In this respect many towns are fortunate in having good possibilities for recreation near at hand. Sofia is surrounded by hills and flanked on the south by Mount Vitosha which rises to 7506 feet; the dam for a hydro-electric power scheme nearby has created an artificial lake for water sports and a fine setting for restaurants and cafes. 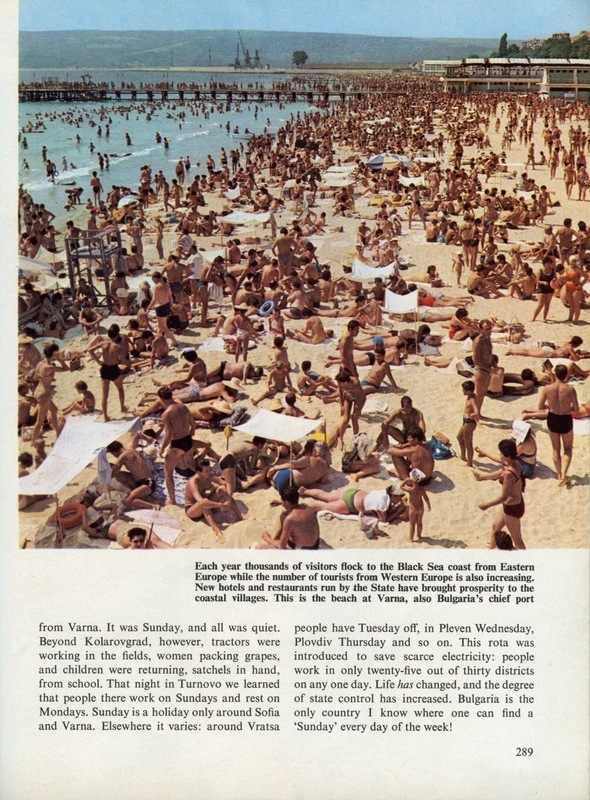 Plovdiv and other towns are near the Rodopi and Balkan mountains, while Varna and Burgas, the growing Black Sea ports, have sandy beaches close at hand. One of the villages I visited was Borovan in north-west Bulgaria. Borovan is well above average size for a Bulgarian village, for it has 5900 inhabitants; otherwise it is typical. 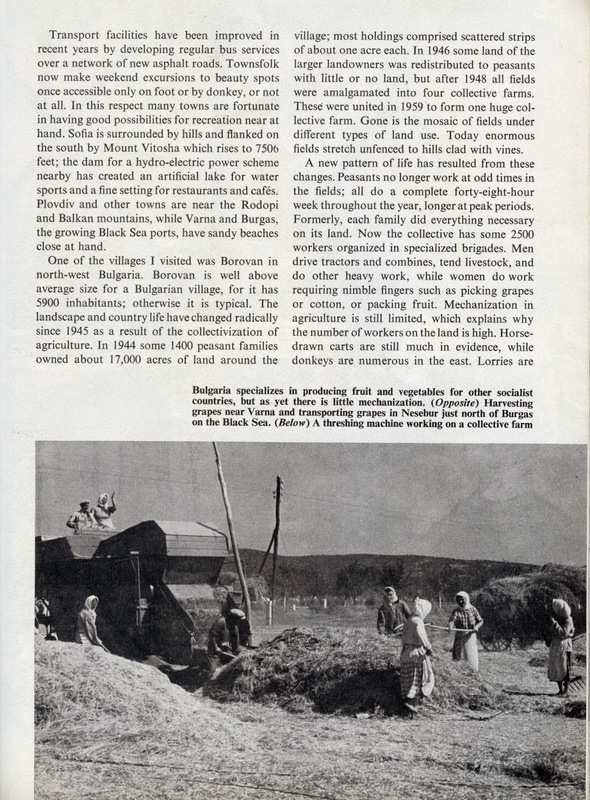 The landscape and country life have changed radically since 1945 as a result of the collectivization of agriculture. In 1944 some 1400 peasant families owned about 17,000 acres of land around the village; most holdings comprised scattered strips of about one acre each. In 1946 some land of the larger landowners was redistributed to peasants with little or no land, but after 1948 all fields were amalgamated into four collective farms. These were united in 1959 to form one huge collective farm. Gone is the mosaic of fields under different types of land use. Today enormous fields stretch unfenced to hills clad with vines. A new pattern of life has resulted from these changes. Peasants no longer work at odd times in the fields; all do a complete forty-eight-hour week throughout the year, longer at peak periods. Formerly, each family did everything necessary on its land. Now the collective has some 2500 workers organized in specialized brigades. Men drive tractors and combines, tend livestock, and do other heavy work, while women do work requiring nimble fingers such as picking grapes or cotton, or packing fruit. Mechanization in agriculture is still limited, which explains why the number of workers on the land is high. Horse-drawn carts are still much in evidence, while donkeys are numerous in the east. Lorries are available to carry men and women to their work but, as they lurch over the rutted, pot-holed cart tracks, they give a punishing ride. Every worker now receives a wage, in Borovan about 90 leva (£26) a month. Generally speaking, villagers now have more time and money at their disposal and they also get two or three weeks’ holiday a year. Not all the land belongs to the collective for peasants are allowed to own about an acre. 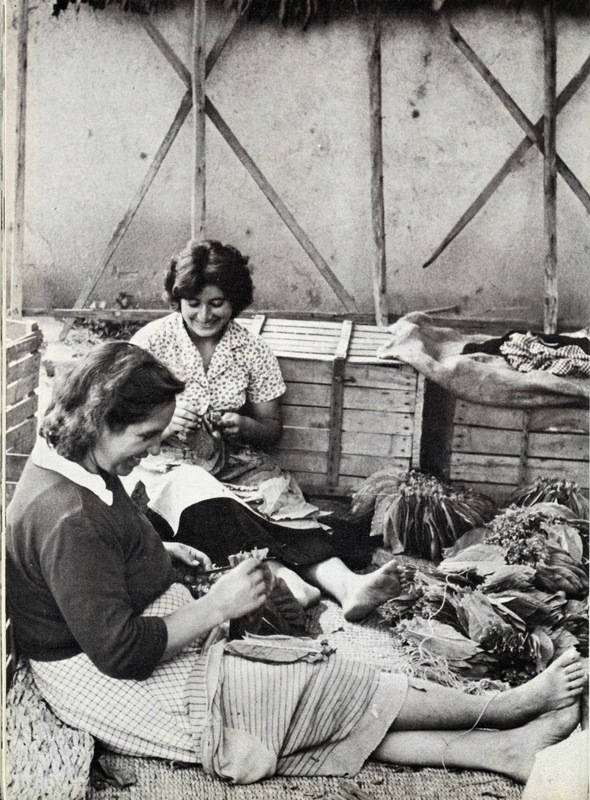 Bulgarians have long been known as good gardeners: in the past they went each year to grow vegetables near towns in the Austro-Hungarian Empire. Now there is no need to grow corn on their plots, so the peasants grow even more paprika, cabbages, and plums than before. The cultivation of potatoes, beans, tomatoes, apples and pears in these garden plots has been encouraged by the provision of seedlings, together with a certain amount of advice. Poultry and a pig or two still hold an important place in the farmyard. Today Borovan, like most other Bulgarian villages is partly new but not particularly attractive. Since 1946 half the rural population (about 2,600,000 people) has built new houses for itself. Families save from their income, and that of sons and daughters who work on the collective or in a factory, to buy bricks from the local brickworks. They build their house in their spare time and I saw many peasants engaged on this in the afternoons and at weekends. The rambling daub and thatch or tile cottage will eventually disappear, except in those villages that are to be retained for their special architectural beauty, for everyone in the village wants to have a new house. The new houses are large, usually with two storeys. The ground floor is occupied by four to six persons. The upper storey is often a store for garden produce, but it may also be let to single persons—like the schoolmistress we knew in one case who had a small living-room and a kitchen. Furnishings seem to be adequate but very simple, and larger rooms are heated in winter from a coal-burning stove which usually stands out from one wall. Not everyone in Borovan works on the farm or in industry. Changes in economic organization and the growth of the social services have led to an increase in the number of professional people living in the village. The schoolmistress I mentioned came three years ago to teach economics in a new Secondary School of Commerce and Technology for 800 pupils where she is one of thirty-five teachers. The collective farm employs agronomists, skilled mechanics, two accountants, and a veterinary surgeon, though more are required. Borovan also has a doctor, a dentist, and a nurse. Not every village is so served, for the production of the education system cannot keep pace with the need for specialists arising from rapid economic progress in a backward society. All the specialists are country folk, though they studied in the towns. 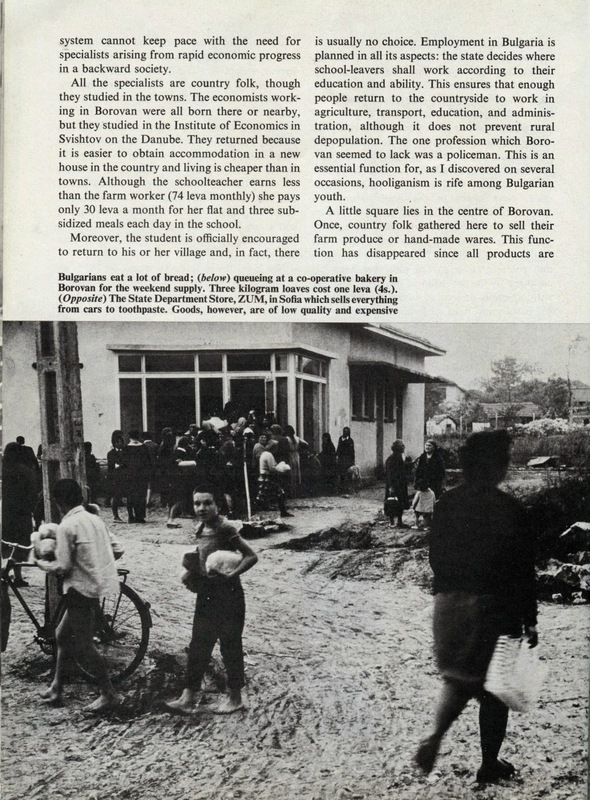 The economists working in Borovan were all born there or nearby, but they studied in the Institute of Economics in Svishtov on the Danube. They returned because it is easier to obtain accommodation in a new house in the country and living is cheaper than in towns. Although the schoolteacher earns less than the farm worker (74 leva monthly) she pays only 30 leva a month for her flat and three subsidized meals each day in the school. Moreover, the student is officially encouraged to return to his or her village and, in fact, there is usually no choice. Employment in Bulgaria is planned in all its aspects: the state decides where school-leavers shall work according to their education and ability. This ensures that enough people return to the countryside to work in agriculture, transport, education, and administration, although it does not prevent rural depopulation. The one profession which Borovan seemed to lack was a policeman. This is an essential function for, as I discovered on several occasions, hooliganism is rife among Bulgarian youth. A little square lies in the centre of Borovan. Once, country folk gathered here to sell their farm produce or hand-made wares. This function has disappeared since all products are marketed by the co-operative farms and producers and are sent direct to state factories, or warehouses in the towns. 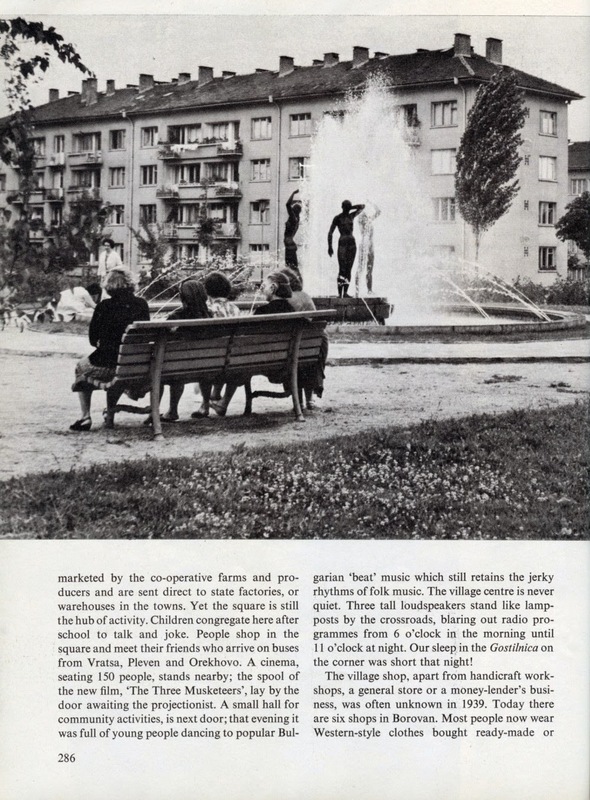 Yet the square is still the hub of activity. Children congregate here after school to talk and joke. 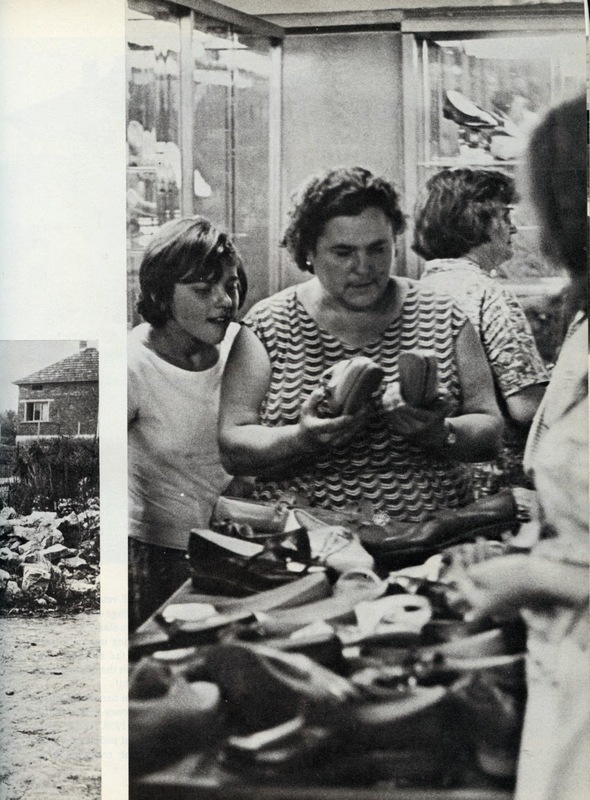 People shop in the square and meet their friends who arrive on buses from Vratsa, Pleven and Orekhovo. A cinema, seating 150 people, stands nearby; the spool of the new film, ‘The Three Musketeers’, lay by the door awaiting the projectionist. A small hall for community activities, is next door; that evening it was full of young people dancing to popular Bulgarian ‘beat’ music which still retains the jerky rhythms of folk music. The village centre is never quiet. Three tall loudspeakers stand like lampposts by the crossroads, blaring out radio programmes from 6 o’clock in the morning until 11 o’clock at night. Our sleep in the Gostilnica on the corner was short that night! The village shop, apart from handicraft workshops, a general store or a money-lender’s business, was often unknown in 1939. Today there are six shops in Borovan. Most people now wear Western-style clothes bought ready-made or made up from cloth by the tailors’ co-operative. For centuries people wore national costumes woven at home; today only the older generations may be seen in those sleeveless jackets, billowing skirts or breeches—except in remote areas where young women may still wear traditional clothes. Similarly, women used to spend hours baking bread at home; now the schoolchildren fetch it from the bakery. There is also a greengrocery shop. The last store is the electrical shop. Rather drab, it sells lamps, dynamos and batteries for use in the home, on the farm, and on bicycles and motor-cycles. A few radios were on sale, but television is very rare outside towns. 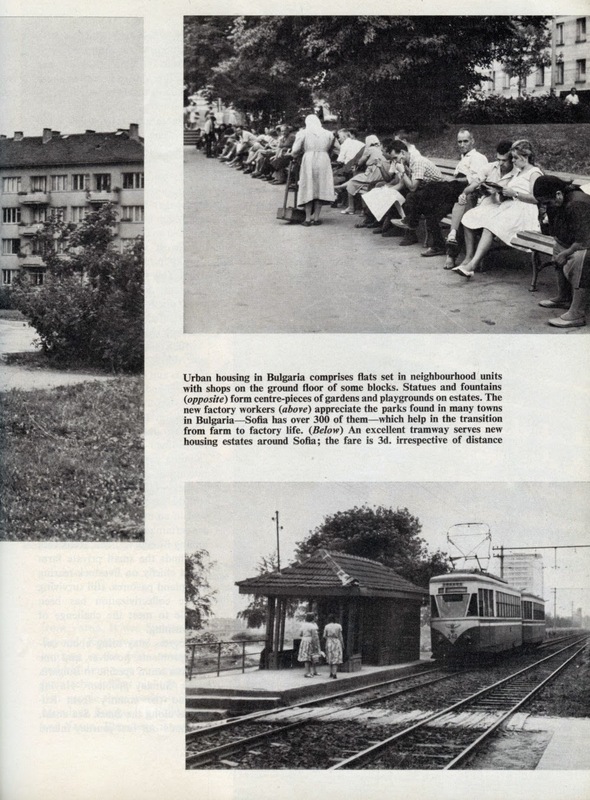 The existence of the shop, however, underlines the progress of electrification in Bulgaria. 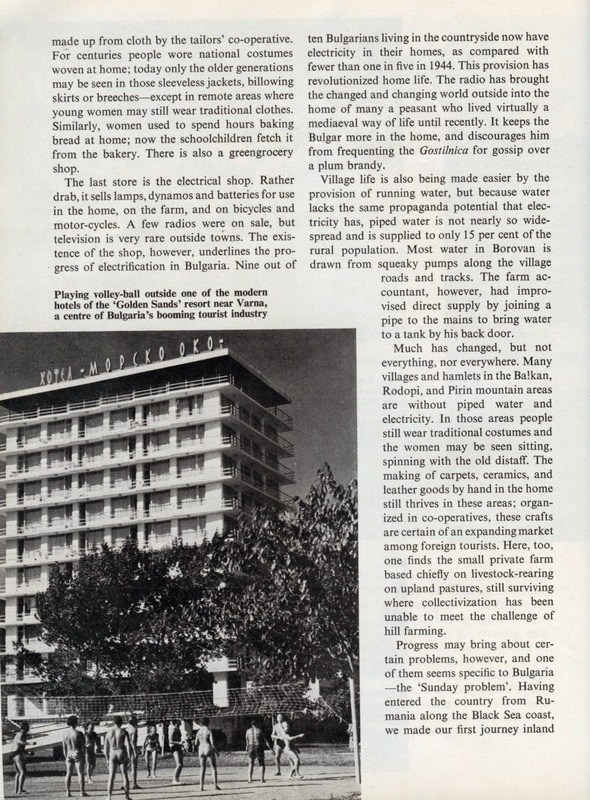 Nine out of ten Bulgarians living in the countryside now have electricity in their homes, as compared with fewer than one in five in 1944. This provision has revolutionized home life. The radio has brought the changed and changing world outside into the home of many a peasant who lived virtually a mediaeval way of life until recently. It keeps the Bulgar more in the home, and discourages him from frequenting the Gostilnica for gossip over a plum brandy. Village life is also being made easier by the provision of running water, but because water lacks the same propaganda potential that electricity has, piped water is not nearly so widespread and is supplied to only 15 per cent of the rural population. Most water in Borovan is drawn from squeaky pumps along the village roads and tracks. The farm accountant, however, had improvised direct supply by joining a pipe to the mains to bring water to a tank by his back door. Much has changed, but not everything, nor everywhere. Many villages and hamlets in the Balkan, Rodopi, and Pirin mountain areas are without piped water and electricity. In those areas people still wear traditional costumes and the women may be seen sitting, spinning with the old distaff. The making of carpets, ceramics, and leather goods by hand in the home still thrives in these areas; organized in co-operatives, these crafts are certain of an expanding market among foreign tourists. Here, too, one finds the small private farm based chiefly on livestock-rearing on upland pastures, still surviving where collectivization has been unable to meet the challenge of hill farming. Progress may bring about certain problems, however, and one of them seems specific to Bulgaria — the ‘Sunday problem’. Having entered the country from Rumania along the Black Sea coast, we made our first journey inland from Varna. It was Sunday, and all was quiet. 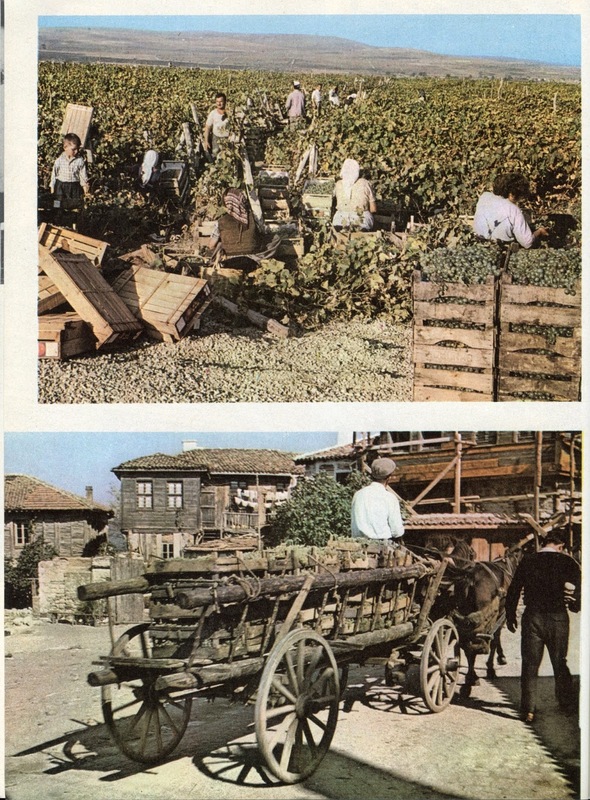 Beyond Kolarovgrad, however, tractors were working in the fields, women packing grapes, and children were returning, satchels in hand, from school. That night in Turnovo we learned that people there work on Sundays and rest on Mondays. Sunday is a holiday only around Sofia and Varna. Elsewhere it varies: around Vratsa people have Tuesday off, in Pleven Wednesday, Plovdiv Thursday and so on. This rota was introduced to save scarce electricity: people work in only twenty-five out of thirty districts on any one day. Life has changed, and the degree of state control has increased. Bulgaria is the only country I know where one can find a ‘Sunday’ every day of the week! 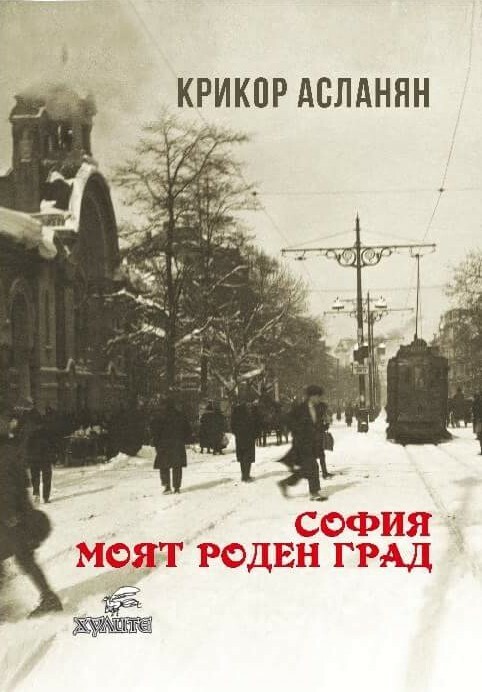 София преди и сега: Булевард "Александър I"
Карта на София през 1917 г.